Construction on the Sturgeon Hospital began in 1968, and truth be told, it never really stopped. Over the last half century, the Sturgeon Hospital has undergone an almost constant process of expansion and renovation and has even undergone one complete relocation. As a county grows, a county hospital has no choice but to grow along with it—a fact that the Sturgeon Hospital can attest to all too well. Here’s a look at its history. During the first century of the region’s history, Sturgeon County residents who required specialized medical aid had no choice but to make the long trek into Edmonton. 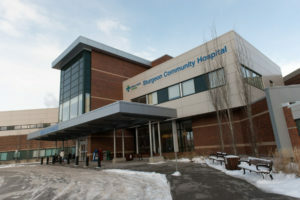 But as the population of the capital region expanded, Edmonton hospitals became overburdened and began to deny referrals from Sturgeon County doctors, unless it was deemed an emergency. By the early 1960s, residents of Sturgeon County, St. Albert, Morinville and Legal were fed up with the lack of medical care they were able to receive and gathered together to form the Sturgeon County Hospital Committee. Their sole purpose was to create a medical facility that would be capable of serving the needs of the county. 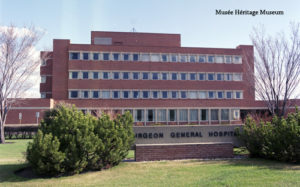 After nearly a decade of planning and fundraising, the efforts of the committee finally paid off when the Sturgeon General Hospital opened its doors on August 5, 1970. The hospital was a four-storey brick building constructed along what would soon become McKenney Avenue. The building was strategically positioned on the northern edge of town so that it could cater to the northern communities of the county, as well as to the anticipated northern expansion of St. Albert. Though it may seem quaint today, the Sturgeon General was touted as a state-of-the-art facility in the 70s. Among its amenities, the hospital boasted a capacity of 100 beds, 3 operating theatres and a 4-bed intensive-care unit, which was unheard of in a rural hospital. The waiting room of the maternity ward was even constructed intentionally too small as a way to encourage fathers to be present during labour—a novel idea at the time. At the opening ceremony, provincial government representatives called the hospital, “the last word in accommodation and facilities.” Unfortunately, that couldn’t have been further from the truth. As early as 1974, there were calls to expand the hospital because it couldn’t keep up with the county’s rapidly expanding population. The anticipated northern expansion of St. Albert was realized, but it came a little earlier than the hospital planners had expected. In fact, residential developments wrapped themselves so tightly around the hospital’s footprint that it limited the facility’s potential for growth. By the late 1980s, it was clear that the only viable option was to demolish the hospital and to start over on a new site. In 1992, the new Sturgeon Community Hospital opened its doors to the public. The hospital had once again been constructed on what was, at the time, the northern edge of the city, but this time it was built with growth in mind. This proved a good decision, as it wasn’t long before the upward limits of the hospital’s capacity began to be tested once again. As part of its technological innovations, the original Sturgeon Hospital was home to the very first elevator in St. Albert. The original Sturgeon Hospital cost 2 million dollars to construct in its entirety. In contrast, the latest renovations to the current hospital cost over 34 million dollars.